a golden hub of sun. 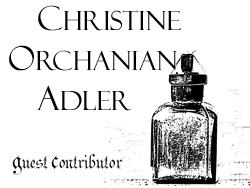 Christine Orchanian Adler is a writer and editor whose poetry has appeared in Coal: A Poetry Anthology, Penumbra, Tipton Poetry Journal, and online at Bird and Moon, Damselfly Press, The Furnace Review, LiteraryMama and elsewhere. She holds a Master’s Degree in Creative Writing from Manhattanville College, and is a former editor of the literary journal, Inkwell. Her articles, essays and book reviews have appeared in various publications throughout the Northeastern United States and Canada. She blogs at www.feedalltheanimals.blogspot.com, and lives in New York with her husband and two sons. This week is being guest edited by Australian poet Michael Fitzgerald-Clarke.